If you need a quick fall dessert, this is it. 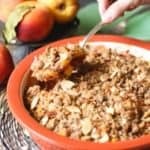 It doesn’t get much simpler than Gluten-Free Peach Crisp. Juicy peaches topped with a delightful crisp topping. It’s screaming for a big scoop of vanilla ice cream! I have a confession…. I’m not really a fan of peaches. But on occasion, if I get my hands on a perfectly ripe and juicy peach straight from the farm stand, I can admit that’s it’s good… for a peach. My kids on the other hand… LOVE peaches! 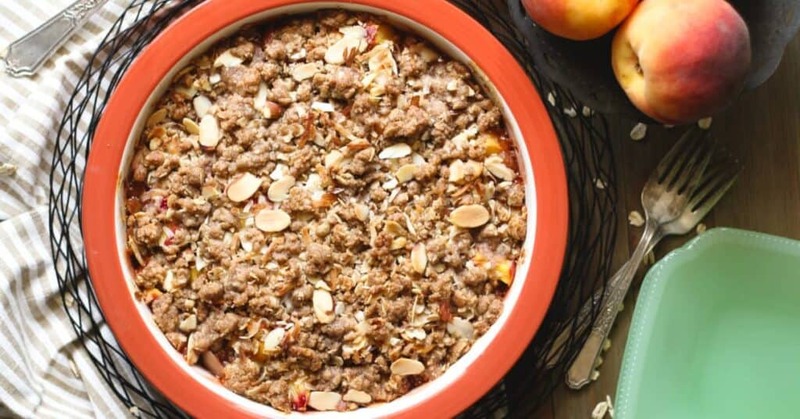 This Gluten-Free Peach Crisp though, is a good compromise. I mean, I can be convinced to like just about anything covered in a crumble topping and a dollop of ice cream. 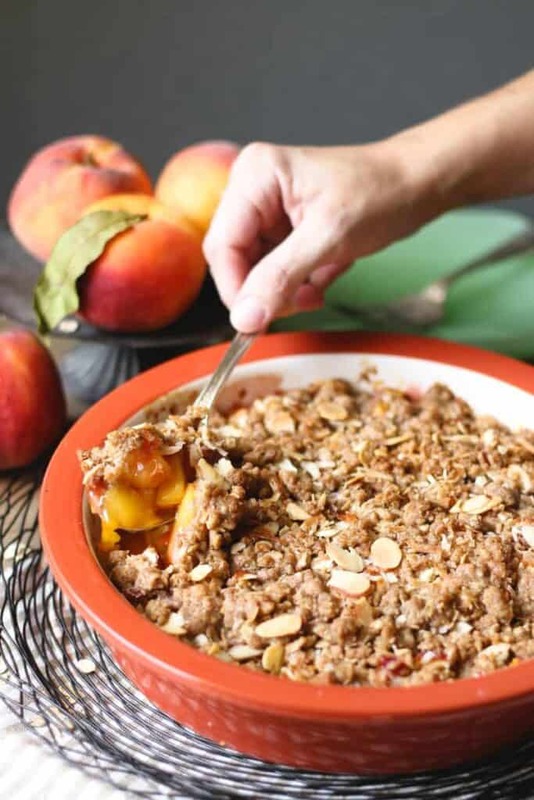 There isn’t a whole lot that goes into this gluten-free peach crisp. If you’ve got some ripe peaches and some pantry staples, like gluten-free flour blend, gluten-free oats, sugar, cornstarch, and maybe some nuts, you’re all set. A cup of blueberries would also be a welcome addition! I used fresh peaches, but frozen would work as well, just allow them to thaw slightly before trying to mix with the other ingredients. Making the crisp is quick and easy. Dice up the peaches and toss them with some sugar, cornstarch, and vanilla. I left the skins on but you could certainly remove the skins if you prefer. Then make a crumble topping to sprinkle over the top. This one has butter, gluten-free flour, sugar, gluten-free oats, almonds, and coconut. You could easily omit the almonds or coconut if that just isn’t your thing. Or substitute with your favorite nut or whatever you’ve got on hand, like pecans or walnuts. To make a crisp topping, start with cold butter cut into small cubes. Put the butter along with the other ingredients into a bowl. Use your pastry knife, two knives, or your fingers to cut the butter into the other ingredients. It should be crumbly like wet clumpy sand and there shouldn’t be any dry looking bits of flour left in the bowl. Sprinkle the mixture over the peaches and bake until the peaches are bubbly and the topping is nice and golden brown. Yum and Yum! I just love those crispy, brown, buttery bites of crisp topping! I know it’s hard to resist, but let it cool a while before you dig in. Fresh out of the oven this is like molten lava… you don’t want to burn your mouth! Scoop up the warm crisp into a bowl and don’t forget the vanilla ice cream! 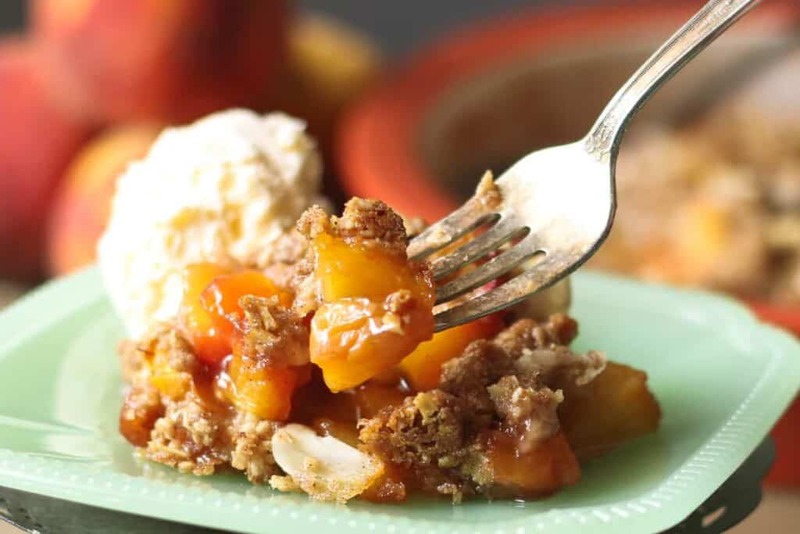 Gluten-Free Peach Crisp is such a quick and easy fall dessert. Juicy peaches topped with a delightful crisp topping is sure to be a crowd pleaser! Dice the peaches, leaving the skins on or remove them. Allow frozen peaches to thaw slightly, about 10 minutes. Put the peaches in a bowl with the remaining filling ingredients. Stir to combine. Pour into an 8-inch round or square baking dish. Put the cubed butter into a bowl along with the gluten-free flour, brown sugar, cinnamon and oats. Use a pastry knife, two knifes, or your fingers to cut the butter into the other ingredients. Keep working until the mixture is like wet sand. There should not be any loose, dry flour left in the bowl. Mix in the almonds and coconut. 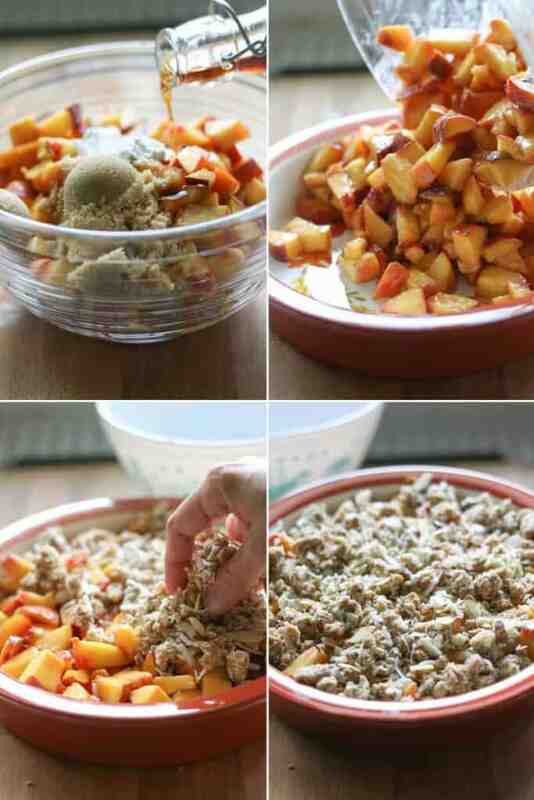 Sprinkle the crisp topping over the peach mixture. Bake at 375° for 30 min, or until the center and edges of the crisp are bubbly and the topping is golden brown. Remove from the oven and allow to cool until the crisp is just warm before serving. Serve in bowls topped with vanilla ice cream. Here’s another great fall dessert! Happy Baking!